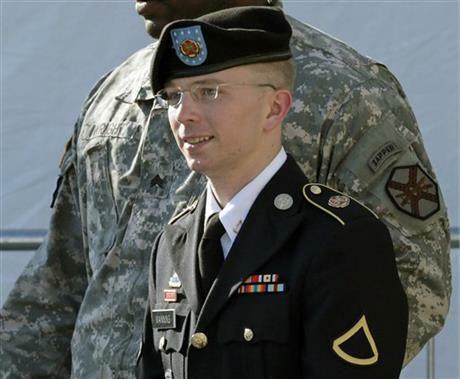 The court martial trial of Bradley Manning begins today, June 3, 2013. The Bradley Manning case is a crucial one, parallel in many ways to that of Daniel Ellsberg and the Pentagon Papers during the Vietnam War ear -- a link Ellsberg himself, still vigorous and an activist at the age of 82, has underlined in his ongoing strong public support of Manning's actions and support of his case. As everyone knows, the government documents Manning conveyed to Wikileaks were presented by major world media print outlets, though the New York Times, the chief US outlet for the leaked information, has denied any responsibility to stand up for Manning, saying it likewise had no feeling of responsibility to Daniel Ellsberg, though they were relieved that he was released. Here are transcripts from a surreptitious recording of Manning's own pre-court martial statement in March 2013 as transcribed by Democracy Now!, which broadcast the statement at the time. It's interesting to note that though various sources had depicted Manning as undone by his youth and discomfort about his homosexuality, neurotic, fearful, or crazed to begin with or as a result of his long solitary confinement by the government, his words were forceful and clear and he spoke in a strong, confident voice that belied all those claims. The quotes are broken up as they were in the program. BRADLEY MANNING: I began to think about what I knew and the information I still had in my possession. For me, the SigActs represented the on-the-ground reality of both the conflicts—of both the conflicts in Iraq and Afghanistan. I felt we were risking so much for—we were risking so much for people that seemed unwilling to cooperate with us, leading to frustration and hatred on both sides. I began to become depressed with the situation that we found ourselves increasingly mired in year after year. The SigActs documented this in great detail and provided context of what we were seeing on the ground. In attempting to conduct counterterrorism, or CT, and counterinsurgency, COIN, operations, we became obsessed with capturing and killing human targets on lists and on being suspicious of and avoiding cooperation with our host nation partners, and ignoring the second and third order effects of accomplishing short-term goals and missions. I believed that if the general public, especially the American public, had access to the information contained within the CIDNE-I and CIDNE-A tables, this could spark a domestic debate on the role of the military and our foreign policy in general, as well as it related to Iraq and Afghanistan. I also believed the detailed analysis of the data over a long period of time by different sectors of society might cause society to reevaluate the need or even the desire to engage in counterterrorism and counterinsurgency operations that ignore the debate—that ignore the complex dynamics of the people living in the effected environment every day. BRADLEY MANNING: It was clear to me that the event happened because the aerial weapons team mistakenly identified Reuters employees as a potential threat and that the people in the bongo truck were merely attempting to assist the wounded. The people in the van were not a threat but merely "Good Samaritans." The most alarming aspect of the video to me, however, was the seemingly delightful bloodlust the aerial weapons team—they appeared to have. They dehumanized the individuals they were engaging and seemed to not value human life by referring to them as, quote, "dead bastards," unquote, and congratulating each other on the ability to kill in a large—in large numbers. At one point in the video, there’s an individual on the ground attempting to crawl to safety. The individual is seriously wounded. Instead of calling for medical attention to the location, one of the aerial weapons team crew members verbally asks for the wounded person to pick up a weapon so that he can have a reason to engage. For me, this seems similar to a child torturing ants with a magnifying glass. While saddened by the aerial weapons team’s true lack—crew’s lack of concern about human life, I was disturbed by the response of the discovery of injured children at the scene. In the video, you can see the bongo truck driving up to assist the wounded individual. In response, the aerial weapons team crew assumes the individuals are a threat. They repeatedly request for authorization to fire on the bongo truck, and once granted, they engage the vehicle at least six times. Shortly after the second engagement, a mechanized infantry unit arrives at the scene. Within minutes, the aerial weapons team crew learns that children were in the van, and despite the injuries, the crew exhibits no remorse. Instead, they downplay the significance of their actions, saying, quote, "Well, it’s their fault for bringing their kids into a battle," unquote. The aerial weapons team crew members sound like they lack sympathy for the children or the parents. Later, in a particularly disturbing manner, the aerial weapons team crew verbalizes enjoyment at the sight of one of the ground vehicles driving over a body. On his hope that the public would be as alarmed as he was about the conduct of the aerial weapons team crew members"
BRADLEY MANNING: I hoped that the public would be as alarmed as me about the conduct of the aerial weapons team crew members. I wanted the American public to know that not everyone in Iraq and Afghanistan were targets that needed to be neutralized, but rather people who were struggling to live in the pressure-cooker environment of what we call "asymmetric warfare." After the release, I was encouraged by the response in the media and general public who observed the aerial weapons team video. As I hoped, others were just as troubled, if not more troubled, than me by what they saw.